As America’s favorite illustrator, Norman Rockwell has long had ties to our nation’s Presidents. As Norman Rockwell Museum’s 2008 exhibition Norman Rockwell: Illustrator in Chief showcased, Rockwell painted not only portraits of many American leaders (Presidents Dwight D. Eisenhower, John F. Kennedy, Lyndon B. Johnson, Richard Nixon, and Ronald Reagan), but also illustrations of important figures (President Abraham Lincoln on several occasions) and events in our country’s history. He was even recognized for his contributions to American culture by being awarded the Presidential Medal of Freedom in 1977. So it seems natural that Rockwell and his work would still find a welcome place with the occupants of our nation’s highest office… we just didn’t know how literally. A recent tour of the White House has called attention to a Rockwell painting which has been proudly displayed in the Oval Office for over a decade, through three recent administrations. Statue of Liberty, Rockwell’s illustration for the July 6, 1946 cover of The Saturday Evening Post, seems a perfectly patriotic and artistic display; the oil on canvas features a crop of Lady Liberty’s outstretched arm, being scaled by several repair workers (miniscule by comparison) doing their best to keep the symbolic statue’s torch alive. Through the painting, Rockwell succeeds in expressing a theme of both national pride and humility. This original oil on canvas work was once owned by noted film director Steven Spielberg, a long-time fan and collector of Norman Rockwell’s work. 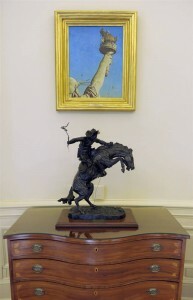 Mr. Spielberg, who serves on the board of Norman Rockwell Museum, eventually donated the painting to the official White House Collection in 1994. Since that time, Presidents Bill Clinton, George W. Bush, and Barack Obama have each had it on display in the Oval Office (an interesting note is the placement of fellow illustrator Frederic Remington’s sculpture Bronco Buster below the painting). An additional series of Rockwell works—appropriately titled So You Want to See The President (Saturday Evening Post story illustration, November 13, 1943)—are also on loan to the White House, and on view in the building’s West Wing.